< After Silver on the 1000m Melissa Wijfje wins the Gold medal on the 3000m. 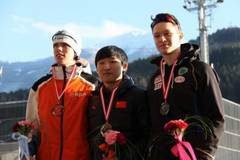 Liu Yiming (CHN) wins the 3000m 21/100 in front of Patrick Roest from the Nederlands. He gets second in 4:00.34. On the third place is Nils van der Poel from Sweden in a time of 4:04.40.